One of the mandatory requirements of Engineers Australia is the submission of a curriculum vitae or CV. Whether you are applying for skill assessment, you want to obtain membership of Engineers Australia, become a Chartered Engineer or register yourself in the National Engineer Register; submission of your resume is a part of the application process. After all, the resume plays a vital role in showcasing technical skills and industrial competencies of engineers. The engineers Australia refers to the resume as a marketing tool that the engineers can use to sell their skills to their employers. So, if you are applying to Engineers Australia and want to know how to write a professional engineer resume for that, keep reading! Before we move on to some important resume writing tips for engineers in Australia latest look at some general guidelines mentioned by Engineers Australia. One may consider the engineering resume template Australia as a guide of what you are expected to prepare a resume that reflects your individuality. While emailing your Resume use a program that is commonly available such as Adobe PDF or MS Word. There are certain predefined sections that the engineers should always include while preparing their resume for Engineers Australia. Also, mention some of your job responsibilities and duties relevant to your job role. Mention the achievements like how many projects you completed successfully. 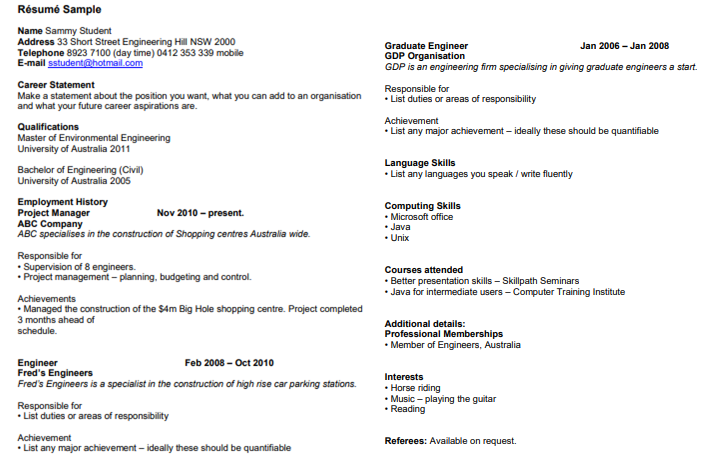 Consider the Engineers Australia resume sample given above. Can you find out why it is a good resume? Although we have already mentioned the format of the resume here are certain tips that can help you in creating a professional engineer resume. Your personal details include your name, contact, address and email. You can also mention your personal characteristics skills and abilities. Mentioning these details helps in creating a good impression of yours on the assessor. Mention only the relevant job responsibilities, roles and competencies so that it would allow the employers to gain a clear understanding of your profile. You can also mention a short career goal at the beginning of your resume to specify your vision and expectations. Make sure your resume is not more than 3 to 4 pages of length. The assessors always look for some specific words which are related to your profession or job role in your resume. So make sure you mention such things engineering resume for Australia. For instance, some software systems that are common in your job profile or some specific skills that the engineers in your job role should have. Mention the highlights of your career, the achievements that you have made and the results that you have got. If you can include statistics for that, it is much better! Mentioning your career highlights is a good way to stand apart from the crowd and put a good impression on your prospective employers. Your educational details serve a way to reflect your ambitions and interests in the engineering field. Apart from university degrees, mention every course that you undertook in order to enhance your knowledge and develop your passion. Your career snapshot of the last 10 years, if can clearly indicate your progression as an engineer, is a bonus for you! It is a good method to showcase your ‘never stop learning’ spirit, your leadership qualities and establishing your expertise in the engineering industry. If you are not asked to put a photograph in your Engineers Australia resume then do not add one. References should also be included only when asked. Make your career objective short, clear and to the point. Do not include any projects in which you had not made a significant contribution. Engineers Australia expects you to mention all your projects in which you have played a noteworthy role. You should mention them in details so that the assessors can check your capabilities accordingly. If there is any period of time in which you were inactive in your career, you should mention the same with a valid reason.